HardieShingle® – Looks Like Cedar, Without the Trouble! Many customers of Krech Exteriors want their homes to have the rich, natural look of cedar shingle siding. But few realize how much maintenance work is required to keep cedar shingles looking good and performing well. That’s why we recommend the remarkable HardieShingle® fiber cement siding product from James Hardie. Fiber cement is a rugged material that is comprised of cement, natural cellulose fibers and sand that are mixed and compressed under high pressure steam to form a solid, durable shingle that can be shaped and textured to resemble wood. HardieShingle® closely mimics the texture and look of cedar shingles. It would be very difficult for anybody to tell the difference once the shingles are on your home. Yet the HardieShingle® product Krech Exteriors uses for siding Minneapolis homes offers many, many clear advantages over wood shingles. Exceptional durability. HardieShingle® panels are composed of fiber cement, which is cement, cellulose fibers and sand that have been compressed and steamed to form a thick, solid material. It won’t expand and contract like wood, so won’t split or crack. Better protection for your home. Fiber cement offers superior protection against all types of weather, including snow, ice, high winds – even hail. Less maintenance. Cedar shingles must be stained or painted every few years to prevent them from drying out and splitting. It’s expensive and messy. You also can paint or stain HardieShingle® panels to get the color or shade you want, but fiber cement holds its color up to three times longer! Lower environmental impact. Because HardieShingle® is not made of wood, no trees are endangered in the process of making the product. Yet it can still be recycled. 30-year warranty. You’ll never get a warranty that long on any wood shingle. But, so long as you have your Minneapolis siding installed by an approved James Hardie contractor like Krech Exteriors, the company will back HardieShingle® for a full 30 years! It is no wonder that more than 4 million homeowners across America have chosen James Hardie fiber cement siding to protect their homes. 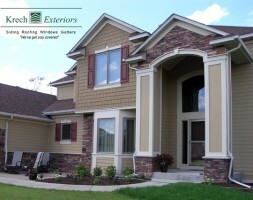 Make your home the next to install James Hardie siding in Minneapolis!